Can You Get 100% Contributory Negligence? You are here: Home / Avoiding Losing Money on Your Personal Injury Claim / Can You Get 100% Contributory Negligence? As a chocolate lover, my taste is more for milk chocolate and white chocolate than for dark chocolate. If dark chocolate is married with another flavour, such as mint, I’m a big fan but, on its own, I’ll always prefer the other varieties of chocolate, if I can get them. With 100% dark chocolate, it means that all the ingredients have come from the cocoa bean. 100% dark chocolate is not to everyone’s taste because of its intense bitterness. In the world of personal injury claims, an area where ‘100%’ could leave an intensely bitter taste in your mouth is in relation to contributory negligence. In the usual case, contributory negligence is where it’s accepted by the other party or their insurers that you should get some compensation for your losses. The catch is that they say it was partly due to your own fault that you got injured – so your full compensation should be reduced by a percentage to reflect your share of the blame. In practice, deductions for contributory negligence tend to range from 10% to 90%. If your claim is worth £10,000 and there’s 10% contributory negligence, you would receive £9,000; if contributory negligence is 90%, you would only get £1,000. A ‘typical’ deduction for contributory negligence (if there is such a thing), would be 20-25%. If, say the bar of chocolate at the top of this post was your personal injury compensation. Of the 10 sections, the 4 broken-off bits represent your contributory negligence. In that case, contrib been assessed at 40% and you are only receiving 60% of the full value of your claim. In this article, we will look at 3 aspects of contributory negligence. Firstly, how contributory used to always be 100%. Secondly, how that position altered due to a change in the law in the 1940s. And thirdly, the basis upon which solicitors for injury victims will always argue that, if contributory negligence applies, you can’t have 100% contributory negligence – the injured person must always recover some percentage of their compensation. Before a change in the law in 1945, if you were partly to blame for your loss or injury, you received no compensation. In practice, judges tried to minimise the effect of this rule. Where there were a number of causes of the damage, they looked at what was the predominant cause and rejected all the others. By forcing judges to adopt an all or nothing approach to compensation, the law often produced unfair results for one side or the other. Now in force for over 70 years, this legislation has withstood the test of time. Its effect was to allow judges to have regard to all the causes of injury or damage and apportion the compensation accordingly. An English Court of Appeal case decided in 1984 made a finding of 100% contributory negligence against the claimant, Mr Jayes. He was an experienced supervisor in the factory where he worked. There was a problem with a power press used to manufacture brass cartridge cases. Jayes called in 2 fitters to sort it out. The machine needed lubrication. The fitters removed a guard on the machine to get access. Jayes used a piece of rag to try and stop grease getting onto other parts of the machine, as the fitters worked. He did this while the machine was turning over. Suddenly, the rag was dragged into the machine and Jayes’ right index finger with it, resulting in a serious injury. So he was frank that what he had done was a daft thing to have done in the circumstances. But should it have been 100% contributory negligence? In 1990, the Court of Appeal got the chance to consider the issue again in the case of Pitts –v- Hunt. Pitts and Hunt were teenagers. They had been drinking together. Pitts was a pillion passenger on Hunt’s motorbike. Hunt did not have a licence. There was no insurance. Pitts encouraged Hunt to drive recklessly. They were weaving in and out of the white lines down the middle of the road, whooping and shouting. They collided with an oncoming vehicle. Hunt was fatally injured and Pitts suffered life-changing injuries. The claim failed, in any event, because they were deemed to have been involved in a joint criminal enterprise at the time. Though it was academic, the Court of Appeal also had to decide on contributory negligence: was it correct to say that Pitts was 100% to blame for his injuries? The court said ‘no’. The court explained that 100% contributory was logically impossible and did so by analysing the wording of Section 1, above. The section begins by setting the precondition that you have circumstances where a person has been injured partly by their own fault and partly by the fault of another. The section then states that the claim shall not be defeated by reason of the fault of the injured person; if you say she is 100% to blame, you defeat her claim. The section goes on to say that the compensation recoverable shall be reduced: use of that word presupposes that the injured person will receive some damages. Lastly, the level of reduction is to be whatever is fair, taking into account the claimant’s “share in the responsibility for the damage”: 100% responsibility is not “sharing” responsibility. In the court’s view, if the claim had not already been extinguished by the ‘joint criminal enterprise’ element, Pitts and Hunt would have been found equally to blame for Pitts’ injuries – so Pitts’ contributory negligence would have been 50%. Pre-1945 (in theory) where a court held that contributory negligence applied, it was always 100% and the claimant received no compensation. Since the law changed in 1945, where a person is injured partly by the fault of another person and partly by their own fault, courts can apportion blame between them and reduce their compensation appropriately. 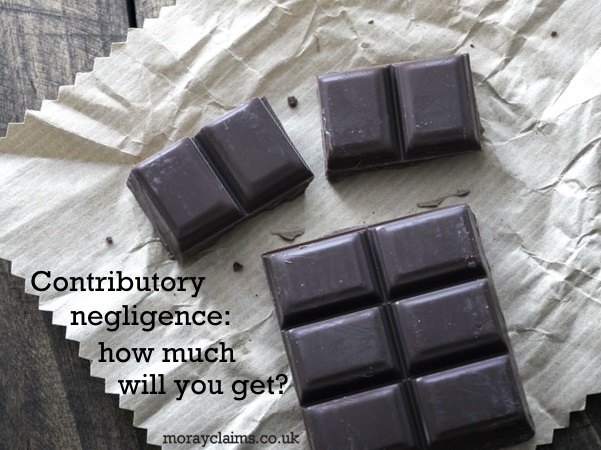 Any reduction in compensation through contributory negligence cannot be to ‘zero compensation’ because 100% contributory negligence is not possible. If you have any questions arising from this article or about any aspect of our personal injury claims services generally, please get in touch with us. All enquiries are fee of charge and without obligation. You can contact Peter or Marie on 01343 544077 or you can send us a Free Online Enquiry. Contributory Negligence: what is it?